Green roof inspections are becoming increasingly important. Inspections are now being required by planning authorities, especially in London, to ensure that a green roof fulfils planning conditions. So where does GIC come in? Firstly, GIC specialises in detailed green roof specifications. This gets it right from the start. 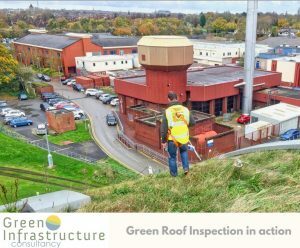 And secondly we have a track record of inspecting green roofs. So we can ensure the design meets for conditions set by the planning authority . Then ensure that the soil and vegetation is installed correctly. Finally this should make the green roof perform as required. Having a dedicate specialist throughout the design and installation of green roofs is therefore even more important. This will save time and money. Having a green roof replaced once installed can incur substantial financial costs if the green roof element needs to be replaced. We are aware of a number of projects where this has happened. Generally, this is where lightweight systems have been used. Such systems may not meet the requisite planning condition. If inspected by the local authority this can cause real concerns. If the green roofs have not been designed to meet the condition and the structure is not right then there is a major problem. The next stage is to address the issues above and make simple and effective recommendations. We pride ourselves, wherever possible, on improving the green roofs we inspect. 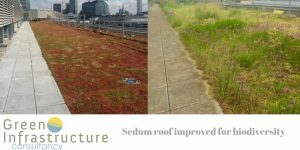 Even poorly performing sedum green roofs, with enough substrate, can be improved. For existing green roofs, an inspection provides an opportunity for improvement. Not only in terms of the look, but also in terms of performance, especially for biodiversity. . Though a green roof might be out of sight, it should still look and work as planned. It is always best to ensure a good specification throughout he process. However, if the roof is not performing, an inspection can resolve many issues. To order a design, an inspection and report don’t hesitate to contact us.